For a summer-lover like me September brings the unwelcome first hints of autumn – the days get a little shorter and the temperature cools. September usually passes much too quickly for me as I try to cling desperately to the last vestiges of summer. October is a dark month then as I resign myself to the passing of summer. By November I have usually accepted the fact and am being somewhat consoled by the fact I can now dig out all the woolly winter accessories and the promise of Christmas is just around the corner. Cream the butter and sugar. Add the vanilla essence and spices. Beat in the egg. Gradually stir in the flour until a dough forms. Roll the dough between two pieces of parchment paper until about 5mm thick. Chill the dough for 30 mins. Once chilled, peel off the parchment paper and place dough on a lightly floured surface. 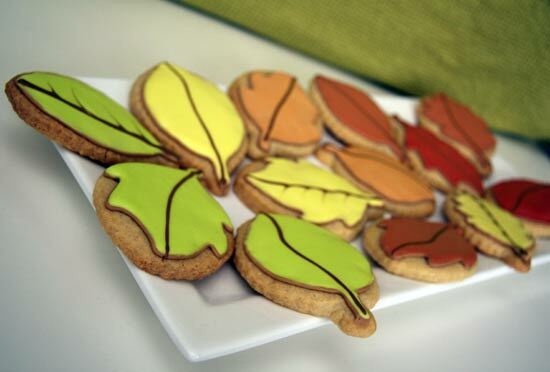 Cut out your cookie shapes and place on a lined baking tray. Chill again for 30 mins. Preheat the oven to 180C and bake the cookies for 8 – 15 mins until lightly golden around the edges. 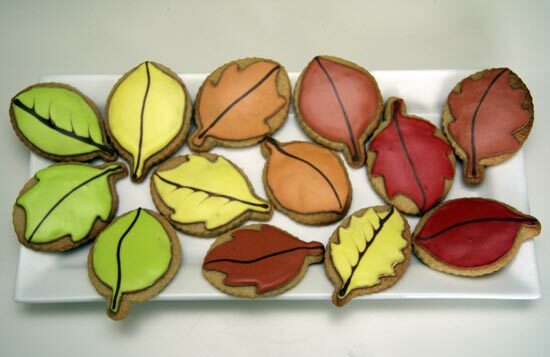 Once cooled decorate the cookies using royal icing. Icing piping bags (for piping details) and several small resealable plastic bags or squeezy bottles (for flooding base cookie colors). 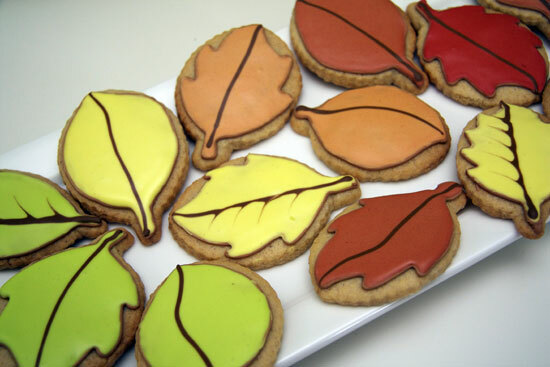 To get a nice smooth finish on sugar cookies like these is actually easier than it might seem. You first pipe a thin outline of icing around each area of the cookie and then ‘flood’ inside the outline with thinner icing, using a toothpick to draw the icing out to the piped edges so it fills the area in a nice smooth layer. The technique is called ‘flooding’ and is explained and demonstrated well by the cookie genius Bridget of ‘Bake at 350’. Prepare your work area before you get started. Make sure you have all your icing bags, toothpicks, wet cloth etc etc etc ready to go before you start icing. I have learned from experience that cookie icing can descend quickly into chaos and defeat if you don’t have all the tools you need within arms reach at the right time! I use clear disposable plastic lunch bags to put my flooding icing into. I mix all the colours I need and put each one into a separate bag, squeeze out all the air and knot the bag. In this way the icing will keep from drying out until you need it. When you’re ready to flood with it just snip the corner of the bag and squeeze it out. Be obsessive about wiping away any dust and flecks of dried icing as you work or they will inevitably end up making their way onto the wet surface of your cookies and ruining your hard work! Give the cookies at least 24 hours to dry before trying to stack them, flooded icing takes quite a while to dry completely. PS. Through the magic of scheduled publishing this blog post is being revealed to you while I am currently lying on the beach somewhere on the turquoise coast in Turkey. Hubby and I have taken an end-of-summer holiday to soak up the last of the sunny season and to explore somewhere totally new. I’ll be back in a week or so with plenty of places, foods and experiences to share so stay tuned!